This is a very lengthy post but please make the effort to read it all the way through. It took a lot of effort to understand the recent history of the area we now call Israel and Palestine and then to figure out how I personally felt about what I learned. I have tried my best to get the facts correct but I have likely made some errors with numbers and dates. Feel free to help me correct these mistakes. Here are a couple of key points to keep in mind while reading this blog post. There would be no Israel if it was not for European Antisemitism. The Jews would have preferred to stay in Europe rather than move to the middle east. The British facilitated the development of a Jewish State for reasons that were anything by altruistic. It is doubtful that there would be any discussion of an independent Palestinian State if Israel had not been created. The first mention of Israel goes back about 3,300 years. The first King of Israel/Judah was Saul. His son David, made Jerusalem his capital. The last time that the Jews had an independent country was around the year 63, when the Romans made the kingdom of Judea a Roman Protectorate. The Romans destroyed the Temple in 70. The Jewish people rebelled against the Romans at various times until 132 when they were given the final boot. Jerusalem was turned into a Pagan City and the country was renamed Syria Palaestina. 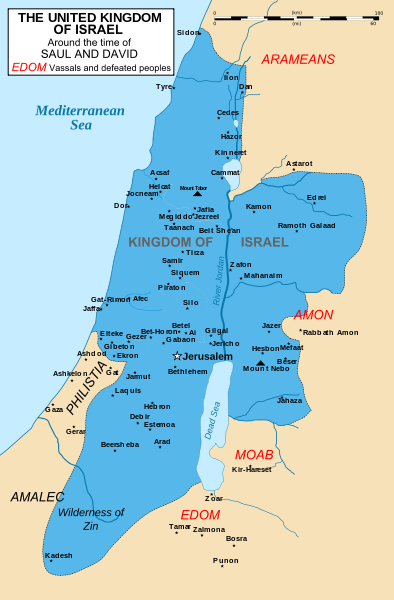 Prior to the Romans, Israel was ruled at various times by the Babylonians, Persians and Greeks. After the romans, it was ruled by Byzantines, Crusaders, the Islamic Empire, the Ottoman Empire and finally the British. A small number of Jews remained through all of these times. There was never an independent Palestinian state. Many of you may will think that all the Jews were living in Israel/Palestine when the Romans forced them out in the 2nd century but that was not really the case. Jews had been spread out all over the middle east more than a thousand years before that. And Jews had began to find their way into Europe even before the Roman conquest. However, all Jews thought of Jerusalem as the center of their homeland and faced Jerusalem when they prayed. The Diaspora is the term generally used to describe the Jews living outside of Israel. In reviewing the history myself, I would say that the concept of a Palestinian Nation goes back to the 1920s. Many Israelis point to this as a way of dismissing the claims of the Palestinian. I find this personally disingenuous. Yes, the Jews had a state two thousand years earlier and the Palestinians never had a state, but I don’t see what that has to do the right of Palestinians to have a state now. The people who are now called Palestinians have been living in Palestine long enough to deserve a national identity. Recent genetic testing demonstrates that most of the Ashkenazi Jews were largely descendents of Jewish men who in many cases had offspring with local European women. This is not the case with the Sephardic Jews. Some therefore argue that today’s Israeli’s are not really the descendents of the Jews that originally lived in Israel. They point out that many Israeli’s have blond hair and light skin, although you can also see Arabs with blonde hair and light skin. In any case, this ignores that over half of the Israeli population is Sephardic and that at least 50% of the genes of the rest came from the middle east. Clearly the Jews have as much a genetic claim to the land the comprises Greater Palestine as the Palestinians. There is a lot of dispute about when the term Palestine began to be used to describe the people currently referred to as Palestinians. But recent genetic analysis would conclude that over 80% of the people referred to as Palestinians are descendents from Jews, Christians and other indigenous people in the area. The majority of Palestinians and Jews share the same Haplogroup. Like it or not, Jews and Palestinians are really cousins, if not brothers. In other words, some Palestinians claim that the Jews that live in Israel are not really descendents of the Jews that lived in Israel over 2,000 years ago. Some Jews claim that the Palestinians are nor really from the area but come later and even came in response to economic development by the Jews. This is also not the case. Jordan itself was only recently created in 1920 when Jordan, Palestine and Israel were divided by the British Mandate for purely political reasons. Some Israeli’s say that the Palestinians already have a state called Jordan, and while I agree that Jordan is largely a Palestinian state, for it to be The Palestinian State, it would have to include the West Bank. Please note that there are also about two million Arabs living in Israel proper. Most Israeli Arabs consider themselves Palestinians but that does not mean that they want to live in a Palestinian State. In fact, there are cities like Umm al-Fahm that are located right on the Israeli side of the border that could easily be made part of the State of Palestine. However, there are clear indications that those living in Umm al-Fahm would prefer to be Citizens of Israel because of the economic and possible social benefits it provides. 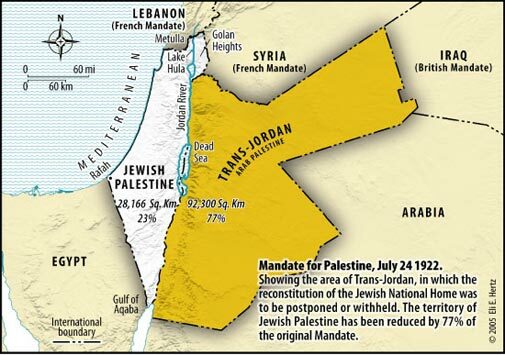 Jordan occupied what is now Palestine as a result of the war of 1948. They made the West Bank part of Jordan, and granted all the Palestinians living there Jordanian Citizenship. This actually doubled the Jordanian population. It would have been correct at that time to say there was a Palestinian Nation. It was just called Jordan. But starting in 2004, they began to revoke citizenship for many Palestinians living in Jordan proper in response to the attempts to overthrow the Jordanian government made by the PLO. I believe but have not verified that, Israel offered the West Bank back to Jordan at the end of the six-day war in 1967 in return for a peace treaty with Israel. But Jordan would not willing to enter into such an agreement. If they had, we would certainly have a Palestinian state now on both sides of the Jordan and it might have ended up being called Palestine or Palestine-Jordan. 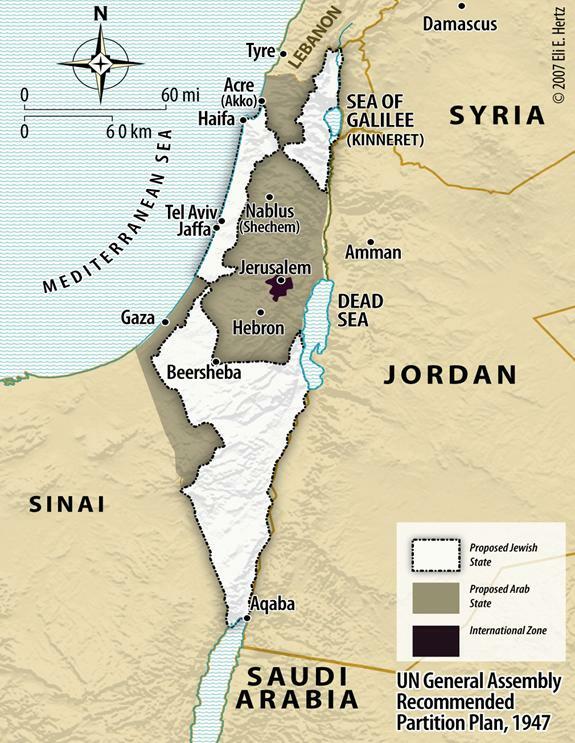 Even if Israel was never established, I am sure that there would not have been a Palestinian State west of the Jordan. Syria, Jordan and Egypt would have just carved up Greater Palestine. After these countries failed to defeat Israel in the 1948 war of Independence this is what they did with the rest and no attempt was made to establish a Palestinian State until Jordan made peace with Israel in 1994. Jordan gave up its claims on the West Bank as part that agreement. It is not clear that Israel wanted that to happen but, in 1971, Jordan forced out Arafat and the PLO after what amounted to a civil war. Jordan no longer wanted to have to deal with additional Palestinians. If in ironic to me that if there is a single person responsible for not having a Palestinian state now, it is Arafat. Palestinians have their own Diaspora. Of the more than nine million Palestinians, about half live outside of the West Bank and Gaza. They are mostly living in Jordan, Syria and Lebanon. A large number of these Palestinians live in what is called “refugee camps” (but don’t think tents think gated slum communities.) Unfortunately, these people have not been assimilated by their host countries in most cases – for instance they have not been granted citizenship. Jordan is the exception. The approximate hundred thousand Palestinians living in the USA seem to have integrated well into American society and many have become very successful. No matter what one might think of Israel’s treatment of Palestinians, they are treated a lot better by Israel than at the hands of their brother Arabs in Syria, Lebanon and Egypt. The large number of Palestinians that claim that their families lived at one time in what is now Israel is at the heart of one of the most difficult issues, “the right of return,” which I will go into in a future blog post. One thing is clear, the Jews that ended up in Europe had a difficult time to say the least. They were subject to awful treatment from Spain to Russia. Frankly, I am amazed that the Jewish people continued to exist throughout this period in Europe. Their population was very small at one point and represented less than 5% of the total Jewish population. I can’t think of a single example of a people who did not have their own homeland for 2,000 years and yet, continued to exist and practiced their region and customs. By 1900, the majority of Jews were living in Europe. They totaled a bit more than nine million and most of these were living in Eastern Europe. The Jews of Eastern Europe were generally poor and lived in small villages, as they were not allowed to live in actual cities. These villages were frequently attacked and the term Pogroms is used to describe these events. All my family came from such places. My great-grandmother came from the village, Piriluki, in the Ukraine. She described such attacks to me when I was a child. But anti-Semitism existed throughout Europe, including countries like England and France and where it, frankly, it still exists. Jewish leaders decided that Europe would never be a safe place for Jews and began thinking about creating a Jewish Homeland. The holocaust proved them right. This was the beginning of what is called the Zionist Movement. 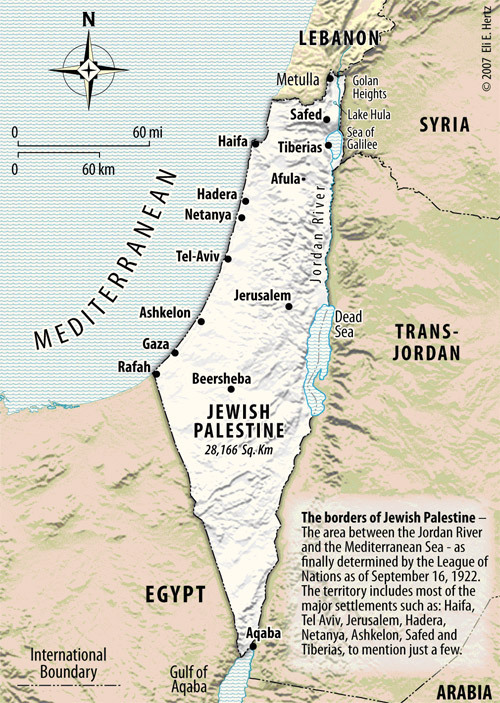 The natural place for a Jewish Homeland was Palestine which include the lands of the ancient Jewish Kingdoms. The holy cities of Jerusalem, Safed, Tiberias, and Hebron were also located there. While the Jews had been expelled by the Romans, there were still Jews living in the “Holy Land” on a continual basis. In addition, the territories were under control of the Turks who had a hand’s off attitude as long as they could collect taxes. The area now known as Israel and Palestine had a relatively small population. It was anything but the Land of Milk and Honey, composed of mostly desert in the south and swamps in the north. The Jews that came to Palestine, came because they felt they had no other choice. Never-the-less, I am sure they could never imagine the Holocaust that awaited those that stayed behind. I am pretty sure that if it was not for Anti-Semitism in Europe that Jews there would never have moved back to the Middle East. They would have eventually integrated in to European Society just as most Jews in the USA have integrated into American Society. Instead, we get the Holocaust which resulted in the systematic killing of over two-thirds of the European Jews which represented 40% of the world’s Jewish population. There still less Jews in the world now then they were in 1940. The Jewish population is less than 0.2% of the world population (unless you are counting Nobel Prizes). What became the British Mandate, the land that is now Israel, Palestine and Jordan, was conquered by many different countries over more than a 3,000 year period. As mentioned, there was not an independent state for more than 2,000 years. The last great power to occupy and control the area was Turkey. They held it for more than 400 years until Britain took that role at the end of World War I, in 1918. It may be a bit hard to imagine that Turkey was once a world superpower. The Ottoman Empire controlled much of Europe from Budapest down to the Middle East and up to Iran and North Africa. This included Syria (which included Lebanon), and Palestine (the current Israel, Palestine, Jordan and Iraq). There were no actual countries in this area. It was all one big Turkey. During this time, the Jews, Muslim Arabs and Christian Arabs living in the region thought of themselves as Palestinian Jews, Palestinian Christians and Palestinian Muslims. Muslim Arabs made up the bulk of the population. But the total population of all people living in this very large area was under a million. The Turks made the fatal mistake of siding with the Germans in World War I (1914-1918). The French and English realized that beating the Turks meant that they could take over the Turkish position in North Africa and the Middle East. In 1922, they got a Mandate from the League of Nations to officially rule this area with the objective of eventually establishing independent states. Of course, what they really wanted to do was colonize them. It was against the backdrop of European Anti-Semitism that prominent British Jews, in particular Barron Rothschild and Chaim Weizmann (a British scientist), approached Lord Balfour with the idea of forming a Jewish Homeland – meaning an independent Jewish State. They even explored the idea of establishing it in what is now Uganda but quickly settled on the ancient homeland of Israel. 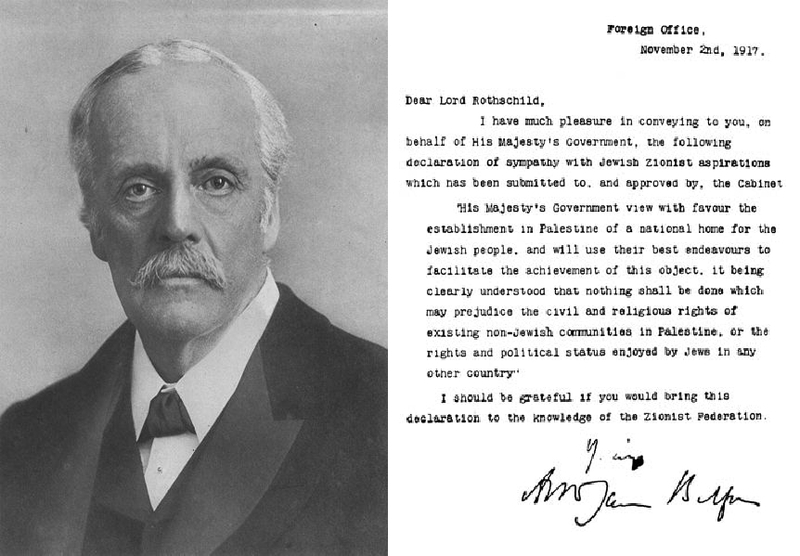 In 1917, Balfour issued a declaration proclaiming support by Britain for the formation of Jewish Homeland. It stated that the civil and religious rights for the non Jews in the homeland would have to be respected. 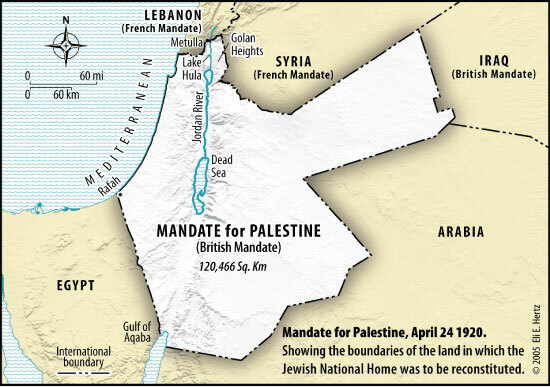 The territories the British discussed were Greater Palestine (all the land west of the Jordan River), which included what is today, Israel, Palestine, some parts of Lebanon, and the Golan Heights. France was not happy with this split and took a bit more of Palestine for themselves and added that to Greater Syria. How anyone thought that the small number of Jews living in the area at that time (less than 50,000) would be able to rule 10 times as many arabs, is anyone’s guess, but the British were really not thinking of a democratic country with a freely elected government. There appears to be a few rather bizarre reasons that the British supported the concept of a Jewish Homeland. First off, they were in a really bad financial situation. They thought they could exchange their support for a Jewish Homeland for financial support from the Rothschild family and other Jewish bankers. They also wanted support from the USA, and two of the key advisors to President Wilson were Jews (Louis Brandeis and Felix Frankfurter.) They also wanted the support of the Russians. They mistakenly believed that because one of the leaders of the Russian Communist Movement, Leon Trotsky was a Jew, helping the Jews get a Homeland would win their support. At that time, the British did not even control the land in question which was still under the Turks. If you really want to make a mess with established national borders, just invite the British in, although one has to admit the French were pretty good at screwing things up as well. In order to get support from the Arabs in their war against the Ottoman Empire, the British promised Hussein bin Ali (the Emir of Mecca) that they would set up a Pan-Arab state from the top of Syria to the bottom of Saudi Arabia that he would lead. This was around the same time they were promising Rothschild and Weizmann a Jewish Homeland that would contain all of what is now Israel, Palestine and Jordan. Get the picture? Later there was a civil war in Arabia, and the Hashemite and Hussein bin Ali were kicked out. Arabia was taken over by the Saudi family and became Saudi Arabia. To placate the Hussein family, Palestine was divided by the British into Palestine, west of the Jordan River, and Transjordan to its east. Abdullah, son of Hussein bin Ali, was made King of the newly created country of Transjordan. Another son, Faisal, was made king of Iraq (giving the Sunni’s power over what was largely a Shiite Muslim country but that didn’t bother the British.) There were only about 200,000 people living in Transjordan at that time, and they were mostly nomadic Bedouins. Of course no one knew yet that Saudi Arabia had oil and Jordan had none or I suspect, the Hussein family might have fought harder to keep Arabia. Now that Turkish Palestine was cut in two, we are left with what I call Greater Palestine, the land west of the Jordan river. This was supposed to become the Jewish Homeland. Giving up the area east of the Jordan was probably not so much of an issue for the Jews since most of the areas they were concerned about we still contained in the land that the British told them would become their country. Obviously, the Palestinians on both sides of the Jordan were not too happy to since they had also been told that the land on both sides would become part of a Palestinian Nation. Yes, the British told each side a different story. There was a census taken in 1923 that showed that the area west of Jordan (today’s Israel and Palestine) had 600,000 Muslims, 75,000 Jews, 75,000 Christians and about 10,000 others but there were millions of Jews that were expect to immigrate to Greater Palestine from Europe. There was little concentration in cities. It was a vast unpopulated area. I am going to skip ahead to the Partition of Palestine that came about in 1947 but I want to point out a few things that happened during that time. There was a major revolt by the Arabs in Greater Palestine in 1936 against Jewish immigration and to demonstrate their desire for independence from the British. The British brutally suppressed the revolt and his created the seeds for Arab resistance that played an important role later in the war against the Jews. The Jews had their own issues with the British. The only thing the Arabs and Jews could agree to was that they hated the British. These feelings were reciprocated by the British. After the Arab revolt, the Peel Commission was appointed to understand what should be done. It was then that the idea of partitioning Palestine into a Jewish State and an Arab state was born. The idea was that both the Jewish and Arab populations would be transferred so that the Jewish State would only contain Jews and the Arab state would only contain Arabs. While some Jewish leaders agreed, the Arab leaders did not agree. The British were afraid that the Arabs would throw their weight behind the Germans who were already attacking the British positions in North Africa. Never the less, the Arabs were sympathetic to the Nazis because they applauded their vicious treatment of the Jews. The link between the Palestinian leadership with the Nazi’s is well established. To reduce the tensions with the Arabs, the British put a quota on immigration by Jews into Palestine. Given the events that took place before, during and after the WWII, especially the Holocaust, Jews were desperate to reach Palestine. Remember that the war with Germany ended in May of 1945. The Jews that were in the camps or in some cases in hiding, ended up in what was called Displaced Person Camps. They stayed for as much as three years. The British would not let the Jews immigrate to Israel and only 50,000 or so managed to do that between the end of the war and the Independence of the State. The british who had been sympathetic with the idea of a Jewish State, turned against the Jews. The Jews formed a resistance movement and began to fight with the British as well as the Palestinians Arabs. The British were being attacked continuously by both the Arabs and Jews for their policies. They had enough and wanted to get out. So they turned the whole mess over to the newly formed United Nations who was now given responsibility to figure out how to handle this mess. The UN decided on partitioning Palestine. I don’t know what the other options were. The map they drew up made little sense but even so the Jews accepted the partition but the Arabs did not. The state of Israel was declared an independent country on May 14, 1948. War broke out. Israel’s Arab neighbors attacked. Brutalities ensued on both sides. In early 1949, an armistice was signed. Instead of a Palestinian Nation, Jordan grabbed the West Bank and Egypt grabbed Gaza. Things would remain pretty much like that until 1967 when the Six Day war resulted in Israel capturing the West Bank and Gaza. During the confrontations, more than 500,000 jews moved to Israel. People that had survived the Concentration Camps and then the Displaced Person Camps literally got off a boat in Tel Aviv and had a rifle put in their hands and were sent to the front lines to fight the Arabs. Until recent times, most Jews actually lived throughout the Middle East and North Africa although by the time of the formation of Israel, this was no longer true. The largest populations of Jews were located in countries that are now known as Iraq and Iran, as well as places like Egypt, Tunisia and Morocco. More than 700,000 Jews were forced out of countries where they had lived for thousands of years as a result of the establishment of the State of Israel. So, while modern Israel was conceived as a homeland for European Jews, it now found half of its citizens came from Arab countries. Later, more than a million Jews from the former Soviet Union would emigrate to Israel. More than 50% of the Jews living in Israel can still trace their family heritage to Muslim countries. In my opinion, the Muslim countries that force out their Jewish populations lost a great deal in the transaction. The last country to do that was Iran in 1979 with the Iranian Islamic Revolution. Most of the 80,000 Jews living in that country for over 2,500 years were expelled. About half ended up in the USA and about 35% in Israel with the rest going to Europe. They make up more than 25% of the population of Beverly Hills and are very successful. The last independent state in what is now Israel/ Palestine/Jordan was a Jewish state but that was almost two thousand years ago. The Palestinians never had their own state but they clearly lived in Israel/Palestine/Jordan long enough to deserve one. The Turks ruled the Area for more than 400 years which ended in 1918. Jews in Europe wanted a Jewish Homeland because of Antisemitism. The British agreed to help the Jews get a Homeland in order to get Jewish support both financially and politically. The British took control of Israel/Palestine/Jordan at the end of WWI from the Turks. The British wanted the support of the Arabs as well so the lied to both the Jews and Arabs and promised them the same land. Jews and Arabs did not want to share a country with each other and still don’t. The Jews and Arabs not only fought with each other but also with the British. Neither side was happy with this but the Jews accepted it and the Palestinians and other Arabs did not. The borders drawn up were not stable in any case. War broke out and the Jews were able to take about 60% of the land that had been promised to the Palestinians by the time a truce was signed. Jordan took the West Bank with Egypt taking Gaza. No Palestinian State was formed and there was no further discussion about doing that. About 700,000 Jews living in Arab nations were forced out even though they have been living in some of those countries for thousands of years. About an equal number of Arabs left what is now the state of Israel and in a sense were replaced with the displaced Jews from the Arab lands. Israel occupied the West Bank and Gaza as a result of the 1967 war. Jordan threw out the PLO in 1970. Israel and Jordan signed a peace agreement in 1994. As part of that, Jordan gave up their claim to the West Bank and the idea of an independent Palestinian state reemerged. That is all for now. The next post on this topic will deal with the Occupation of Palestine (the West Bank and Gaza). It may be a while in coming as I am continuing to do my research, which include visits to Palestine. Tags: Israel and Palestine, Palestine. Bookmark the permalink. Superb analysis. Still needs acknowledgement of vast Jewish expansion of arable land, increasing its ability to support a human population by 10 fold as compared to Jordan. The 600 K muslims in 1923 included perhaps 300K attracted to the area by the extraordinary feats of reclamation recounted in Walter Loudermilk’s superb book of 1939 which described his agricultural analysis of the area for the Roosevelt administration. There are now more Arabs in the territory than ever before. The Jews made this possible. Typos: “100 million Palestinians in US” and Jordan “through out” Palestinians. Avram, thank you for this thoughtful reflection on the situation in the Middle East. Needless to say the whole area has gone through a convoluted and tumultuous, and often torturous route through history to where it is today, and who knows what lies ahead. But as you pointed out, past actions by several parties, mostly self-serving, played a pivotal roles in shaping history in that part of the world. If you haven’t already, I recommend you read Margaret MacMillan’s book, Paris 1919. She presents, sometimes in excruciating detail, the aftermath of WWI and the political maneuverings of dozens of countries, each with their own “agenda”. The book also shows how the “allies” in their treatment of Germany really did pave the way for someone like Hitler to come to power. Avram, a pretty good summary of the long history of the Middle East. Sadly, too many people are ignorant of this history. Too many people think that the problems began with the Six Day War and don’t realize that the “occupied territories” were occupied for nearly twenty years by Jordan and Egypt. I don’t know if we will ever see a solution, but at least the discussion should be from understanding the history. BTW, it wasn’t just the Middle East that was screwed up. After World War I, the Allies created artificial countries such as Czeckoslavakia and Yugoslavia that only stayed united as long as they were ruled by a strong dictator. As soon as the dictator fell, these countries reverted to their original ethnic nationalism. David was not Saul’s son. Your synopsis well illustrates that neither side in the mess has can claim complete justification for their own view and unreasonable position of the other. That said, it seems like the Arab interests were more ignored than the Jews’ by the British. There were both Jews and Arabs living on both sides of the Jordan, but I think it could be argued that the British assumption that giving all of West Jordon to the Jews would be ok with the Arabs living there is pretty presumptuous. And if they had enforced the plan by forcibly removing all west-side Arabs and east-side Jews to the other, it would have created more stable states that hated each other such as India and Pakistan. Even so, I think such a situation would have been much more in the Jewish interest than the Arab. Given the history and the current situation, both sides must realize that they have to give up some of their perceived rights and compromise to have a secure and peaceful life. There are too-strong voices on both sides that are not interested in such pragmatism and would rather perish than yield their percieved rights.